North American Expats Retire to Chile: Eruption! On Wednesday, April 22, one of our local volcanoes erupted. Volcan Calbuco sits on the southern edge of Lago Llanquihue. It hasn't erupted in over 40 years but Wednesday afternoon we had a great plume of ash erupt into the sky about 6 PM. See pictures below. Quite exciting and spectacular and unexpected. All that evening we had lightning and rumbles of thunder and earth tremors. The volcano is about 80 miles from our farm so we were in no imminent danger. 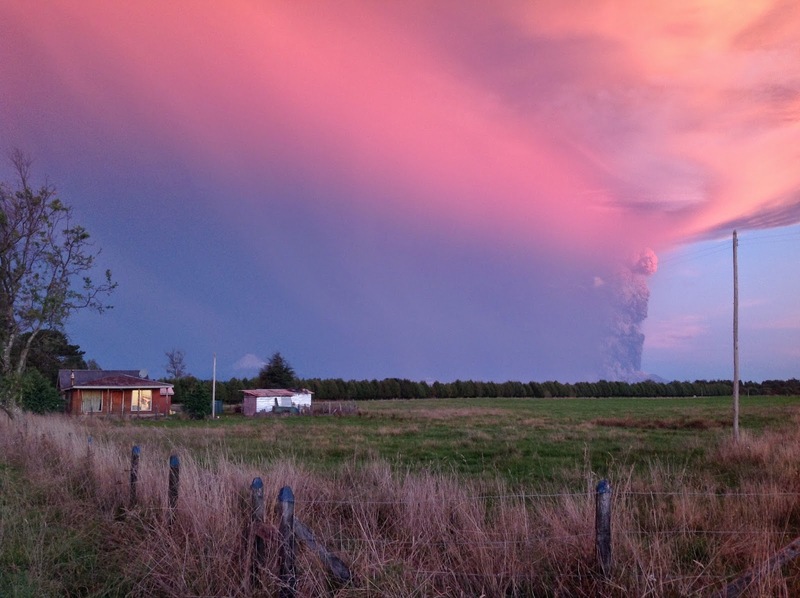 The ash cloud moved northeast and dumped a lot of ash on the mountains and into Argentina. Later that same night was another eruption with spurting lava which was seen by our boys in the house in Quilanto along with phenomenal lightning. All the schools were closed to house the thousands of refugees from the eastern side of the lake because of the ash cloud. As of May 1, we had one more minor belch of ash cloud so I guess all is not over yet! See Volcan Osorno to the left of Calbuco. The snow cap is now covered with ash. The eruption at sunset was quite spectacular. Glad y'all are alright. Prayers continuing. Thanks for the pictures. So that was the volcano that gave us all the ash here in Pucon! Must have been a sight to see. It was pretty exciting! Maybe a once in a lifetime event well, maybe not here! And most of the ash blew NNE.